Arkansas, Colorado, Illinois, Kansas, Kentucky, Minnesota, Missouri, Nebraska, Ohio, Oklahoma, South Dakota, Texas, and Wisconsin. The 2016 St. Louis Super Regional was held Oct. 21–22 at The Dome at America's Center (previously named Edward Jones Dome). Broken Arrow won their fourth consecutive St. Louis champion title. As was expected, Broken Arrow had little difficulty winning prelims and finals. They received first place from all but one judge the entire weekend. But this was the first and last BOA competition for the former national champion. While we continue to have BA ranked as one of the top groups in the nation, we won't get to see how they stack up against the other best groups in the nation until next year. Blue Springs carved out a place behind BA, but ahead of the rest of the pack. As they continue to improve year over year, we expect to continue to see them place closer to some of the nation's best groups and further ahead of others. Owasso seized the bronze medal, a good position to be in a few weeks before they perform at Grand Nats. But it won't be a guarantee. This year's Grand National Championships features one of the most difficult line-ups ever, and a strong semifinals placement is very respectable. Rosemount earned third place in prelims, most notably receiving second in both the individual and ensemble music captions. In finals, the group slipped to seventh place overall, but that prelims score shows they are not a group to be counted out in the future. Bellevue West, O'Fallon Township, and Union all earned placements in the top half of finals, and all will be performing at Grand Nats in just a few weeks. Semifinals should be attainable for all, but this year's finals competition is so stacked, it likely won't include any of these groups. Once more, the St. Louis Super Regional is shaping up to be one of the most competitive and unpredictable events of the season. Although the very top spot does not appear to be in question, the competition on the bubble will be brutal as usual, and the order within the finalist bands is completely up for grabs. Without further ado, here are our projections, with specific placement predictions at the bottom. in front of a packed house at a home football game. Broken Arrow is the defending national champion and the defending champion at St. Louis for three years in a row. Expect them to make it four. What BA excels at is an insane level of visual cleanliness. The way they coordinate that visual program with their music is unmatched by any other group in the region. Even with the loss of Wes Cartwright, there's no other group that will be able to steal the title. Blue Springs became the first band from the state of Missouri to ever make Grand National finals in 2015. That gives them a level of momentum that could push them into this top position or could be wasted. Blue Springs has been on a continuous trend of improvement for years, and they’ve shown no signs of stopping. You can bet they’ll want to improve on their third place finish from last year, and second is wide open once more. Owasso did not compete at St. Louis last year, but they will be gunning for second place this time around. Their only BOA placement last year was a very impressive eighth place finish at San Antonio, and if that level of performance is here again this year, they could easily finish just behind BA and maybe even cause them some concern. In fact, Owasso is the last band to win the St. Louis Super Regional not named Broken Arrow, granted it was during a year that BA did not attend the super regional. Spring High School. // Photo by Jeremiah Wooten. Union is the third of four Oklahoma bands likely to fill out the top four placements. They placed second in finals last year after finishing fourth in prelims behind Blue Springs and Bellevue West. Union always seems to be difficult to project, but we aren’t complaining. Coming off a convincing victory with only half a show at the Golden Regiment Invitational hosted by Blue Springs, Union could very easily repeat as runner-up. And since they will be returning to Grand Nats this year, they'll be pulling out all the stops as they hope to return to Grand National finals. Air Academy is easily one of the most pleasantly surprising and entertaining groups at this competition last year, we're excited to see how they place. It’s awesome to see these guys making the trip from Colorado once more. Will they keep moving up? We can’t wait to find out. Bellevue West actually beat Union in prelims last year. And who is to say they won’t do it again? It would take a lot, but they are coming off the heels of last year's show, which was one of the most entertaining shows from any band in recent memory. If they can whip up another one like it, then they could finish even higher. Springs High School. // Photo by Jeremiah Wooten. 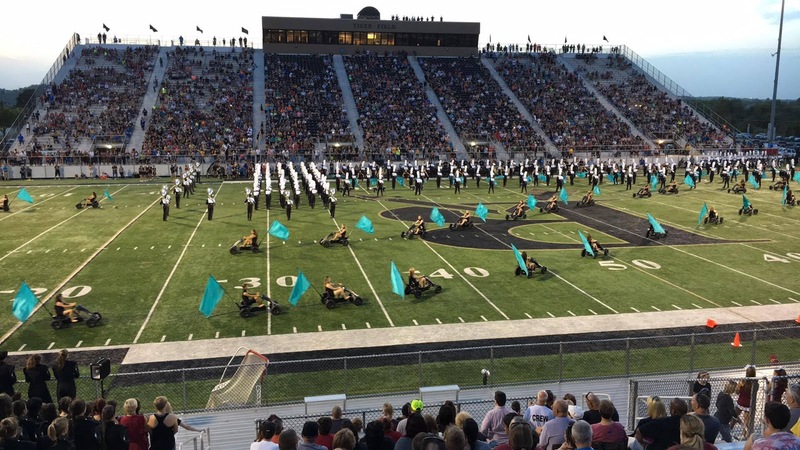 Bentonville has gone through some tough changes this year with the launch of a second high school in the district, but we haven't seen any of the devastating effects some people predict when band programs are split like this. As long as that continues, we’re going to keep betting on this band. The recent trend upward in placements is not because of luck. If all goes well, Bentonville will be quite the force to be reckoned with in the near future. Eden Prairie did not make semifinals at Grand Nationals, which was shocking based off of their performance last year at St. Louis. Their Alice in Wonderland-themed show was memorable and well executed. Don’t expect them to slip down in the placements here. Haltom has been impressive for the past couple of years at this contest, and there’s no reason that should change. A solid program from the Lone Star state, expect them to be representing Texas in finals once more. O'Fallon Township surprised us with their 12th place finish last year, a placement many people considered too low. When it was announced at retreat, you could hear a pin drop in the stadium. But if you think that O’Fallon isn’t coming back with a vicious chip on their shoulders, you better think again. Expect them to be near the top half once more. Blue Springs High School. // Photo by Jeremiah Wooten. Rosemount is the other perennial finalist from Minnesota, and you can expect them to keep their streak of finals appearances going this year. Last year, they had quite the crowd-pleasing show, a ramp-filled, bike-riding ten-minute bonanza. While this year's show is not quite as high-octane, it is still extremely entertaining and well executed, so much so that their performances already this year earned them a spot in our top 30 for the first time in the program's history. Bixby is back in the BOA circuit after an absence that can only be described as too long. And they're not coming back quietly. Last year, they made a massive leap from prelims to finals at this competition, which gives us cause enough to put them on the higher end of the bubble, but don’t expect them to settle for anything less than another finals appearance. Blue Springs South made a very impressive showing at the Clarksville Regional in 2015, finishing right behind Franklin. At Powder Springs earlier this year, they impressed us again, finishing only a few points behind Harrison. Although obviously not as prominent as their neighbors to the north, expectations for this group within the state are extremely high, and they have the program set up to be immensely successful for years to come. This event should be a great barometer of their current performance level, and hopefully a sign of good things to come. Grain Valley surprised everyone by making finals in 2014. Just a year later, they surprised everyone again by not making finals. After watching them over the course of the past few weeks, we’re not positive which Grain Valley will appear again. We're hoping it’ll be the one that competed in 2014, but nothing is for sure. Jenks did not compete at St. Louis last year. However, they had a solid performance at the Arlington Regional, and they did make finals at this competition in 2014. And they come from the same place as BA, Owasso, and Union. Expect them to likely be in finals once more. Lincoln is one of the surprise finalists that stood out last year. They were very impressive in person, particularly the incredible wall of sound that they produced. There aren’t many competitive bands from South Dakota, but Lincoln is the cream of the crop, and a must-see this time around. Richland is yet another solid band from Texas, and although we’re not completely sold, their win at the Lone Star Preview Competition is enough to give them a serious look at, in the very least. They’ll have a very good shot at stealing a finals spot from one of these other deserving groups. Camdenton finished just behind Blue Springs South at Clarksville and just one spot out of finals here at St. Louis last year. Although their scores so far this year are not quite as impressive as in 2015, it is not inconceivable that Camdenton rises even more and jumps into finals. Eastview is the third Minnesota band being discussed for a finals spot. It’s possible. Eastview quietly finished 17th last year, and were impressive in person. They could be the dark horse that breaks the top fourteen. Fort Zumwalt North has been quietly placing fairly close to finals for several years, but the group has never been able to make a real statement performance. Based off their finish at Powder Springs, this could be the year for that statement that pushes them into finals. Kickapoo has just managed to sneak into finals just barely for two of the past three years. It's a very tough year for bubble bands, so sneaking into finals this year will prove to be a much more difficult task than it was in years past. Rockwood Summit is much like FZN, this local band has been very close several times now and placed 18th last year. There have been some changes in the program, but perhaps this may actually affect the scores in a positive direction. We will have to wait and see. With thirteen returning finalists and a handful of new challengers, we expect that many great programs hear disappointing results on Saturday afternoon. It's not that they aren't great, but the number of great groups at St. Louis continues to grow year after year. We'll be covering the event live all weekend, so make sure you are connected with us on Twitter, Facebook, and Instagram, so you don't miss a second of the action. Music: Mark Calima, Daniel Galloway, Van Matthews, Paul McGarr, David McGrath, David Orser, Greg Williams, and Daniel Wood. Visual: William Chumley, John Fisher, Tom McNalley, Frank Miller, Randy Nelson, and Michael Stone. Glad to see South finally go to a super regional! I hope to see two Blue Springs high schools in finals this year! Waiting on predictions, this contest is stacked this year. Can't wait to see how the finals bands are gonna be hoping to see Bixby and Jenks up there! Looking forward to see Owasso compete back in St. Louis this year! I think you are underestimating Jenks Big time this year. I think they are going to finish in the 5-7 area. Good luck to all Minnesota bands!! Proud of them all! Have fun kids! Kind of weird that O'Fallon is in the top 30 while B'ville isn't but still have B'ville above in predictions. Personally, I think you will see Bentonville in the Top 5. Bentonville got cheated out of it this year.